1) Catalyst must be added prior to use. Scrape sides of container with a rubber spatula to ensure catalyst distribution. 7) The rubber will penetrate into porous substrates such as wood and poured concrete. A primer/sealer should precede application of rubber. The application of liquid rubber coatings is easiest when the surface is flat, clean and smooth. As is the case with all painting jobs, the most time-consuming part could be cleaning and repairing the surface. How to clean the surface depends on the material. 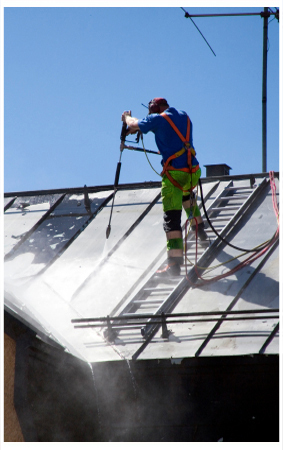 For metal roofs, sweeping and/or washing may be all that is necessary. You should make sure there is no debris on the surface, because any debris will show through the coating. Concrete floors should be as smooth as possible. If cracks or holes are present in any material, fill them with a non-silicone based caulking. The rubber would fill the hole, but a dent would still be visible. Depending on the depth of the hole, this could cause a variety of problems in the future. For some older roofing materials, it is a good idea to reinforce the surface with butyl tape and polyester fabric. For example, if there are gaps, tears or other defects, you would want to correct those problems. Although the coating does not adhere to all materials, it does adhere to fabric. Depending on the surface to be covered, a catalyst coating may be needed. For example, the application of liquid rubber coatings to existing asphalt-based roofs requires a pre-coating with an elastomeric catalyst. Follow the manufacturer’s directions concerning what type of pre-coating to use. Generally speaking, latex house paint is not an acceptable solution. You will need a squeegee, a roller and a paint brush to apply the coating, once the surface has been prepared. The thickness usually recommended for the coating is 20-mil. It may be necessary to do a spreading rate calculation to get an idea of how that thickness can be achieved. A good estimate for a flat smooth surface is 40 feet per gallon. The application of liquid rubber coatings to uneven surfaces will require more. The product needs to be spread as evenly as possible. You want to avoid making it thicker in some spots and thinner in other areas. The squeegee is used initially to spread the material. It is recommended to follow the use of the squeegee with a roller to promote more even distribution and get rid of any air bubbles that may be trapped within the liquid. The first 2 gallons usually take one or two hours to apply. If you have already determined how many gallons you need, this should give you an idea of how long the application of liquid rubber coatings will take. You should be able to get the job done in a day. Here you can learn a bit about liquid roof and its benefits for new and existing construction. Let’s start with the basics. Liquid roof is a liquefied version of a synthetic rubber typically referred to as EPDM. The letters EPDM stand for ethylene, propylene, diene monomer and M class respectfully. Before the liquefied version came on to the market, rolls of the rubber were used for waterproofing roofs. The liquids are easier to apply. They fill up cracks and crevices. They can go where the sheets could not go. Ease of application is one reason. The foil is more difficult to apply correctly. You could easily end up with bumps, overlaps and uneven spots that contribute to water pooling. 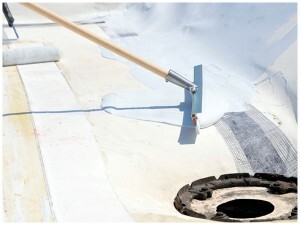 Water can seep under the rubber sheets and cause the roofs to leak. So, while the rolls were the best choice for waterproofing at one time, there are better choices today. The liquids have more uses. They can be used on RV roofs and other vehicles. They can be applied to a wide range of roofing materials including metal, fiberglass and wood. Through the use of an undercoating, the liquids can be applied to built-up and asphalt-based coatings. Other reasons to choose the liquids are listed in some detail below. For new building construction, applying the liquids increases the lifespan of caulks and sealants used to waterproof around flashing, vents, HVAC units and other protrusion points. If the new roofs are made of steel or aluminum, the liquids prevent rust and effectively extend the life of the roofing material. If you choose white, which is the base color typically provided; the coating reduces heat within the building and also helps to protect the surrounding environment from excessive heat. Black and dark colored roofing materials are partially to blame for the high temperatures seen in southern cities during the summertime. By reducing heat within the building, the coating helps reduce air conditioning costs. When applied over the entire area, the coating provides the same benefits for existing roofs as it does for new ones. It can also help to reduce noise from rain falling on metal roofs. For roof leaks and general waterproofing, the roof coatings are the least expensive and most effective choice. So, there you have the facts about liquid roof and its benefits. It’s a money-saving environmentally friendly alternative.